YOU can’t have escaped the row over welfare reform which we are told risks pushing Stormont over the edge. The stand-off between the DUP and Sinn Féin around administering welfare cuts has dominated political debate for months. But despite the dire implications, Assembly sources believe the narrow terms of the debate have suited some Stormont parties. The row over welfare has, according to critics, helped draw a veil over mishandling of the Stormont purse and disguised the fact that deeper problems exist. The immediate crisis faced by the Executive includes welfare ‘fines’ of £87million, but this is against a backdrop where there was already an over-commitment of £78million in Stormont’s budgeting, while a further £135million of “inescapable pressures” have also been recently identified. It is being argued that this means the dilemma in this financial year is ‘one-third welfare pressures, but two thirds poor planning’. A senior source said: "What we have at the moment is an Executive that is overspending its credit cards. Savings agreed in August addressed the £78 million over-commitment by imposing a 2.1% cut on all Assembly departments except health and education. But the £87million welfare ’fine’ and the additional £135million remain to be dealt with. That leaves Stormont with a £222million hole to fill in the short term. Now the Treasury has been formally notified by the head of the civil service here that Stormont appears to be heading into the red in this financial year. Some forecasts predict cuts of more than 20% to departments in 2015/16 if health and education remain protected. Sinn Féin has argued that the current budget pressures largely trace back to what were effectively cuts by Westminster in the block grant that is provided to Stormont. That had already forced £4billion savings on the Assembly’s 2011-15 budget. The party claims that in 2009 the total funding from Westminster amounted to £5,500 per person in Northern Ireland, but by 2020 that will have dropped to £4,500 per head. Despite all the monetary mud-slinging, the reality is that the Treasury will want assurances that Stormont can stay within its spending limits. Among the options currently being discussed is that Stormont could be allowed to kick some of the costs into the next financial year, but the prospects are already bleak for 2015/16 when welfare ’fines’ will rise to £114million. The extreme option is ‘Direct Rule’, where the collapse of the Assembly would see the reins being taken up by ministers from Westminster. Not far off that is a fairly humiliating alternative, dubbed ‘Whitehall Rule’, where the Treasury could effectively oversee Stormont’s budget and deduct money from the Assembly to keep it within its limits. Despite all this, it is being argued by senior figures at Stormont that the driving force in this crisis isn’t financial, it’s political: the cash crisis is a symptom, not the cause. The British and Irish governments have been disengaged for a considerable period of time. The DUP is feeling the strain of living its political life shackled to Sinn Féin. And after the parties put a series of political controversies on the long-finger, due to an inability or unwillingness to do business with each other for years, they are finding it is more difficult to do that with Westminster’s money. The DUP, meanwhile, is suddenly saying that the Assembly is not fit for purpose. The governments in London and Dublin hope the negotiations they are planning will rescue the situation. While confident predictions of a breakdown are common, there are occasional hints that it is possible sufficient progress could be squeezed out of these talks to avoid an immediate crash. 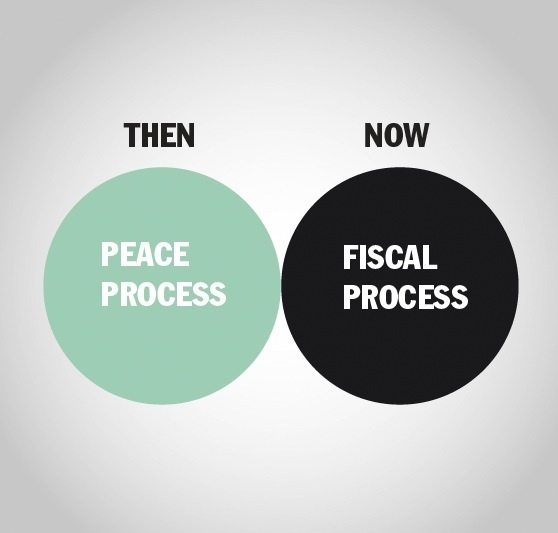 But some at Stormont are now concerned that an over-emphasis on the fiscal process, albeit important, is missing deeper fractures in the peace process. Belfast talks need a deal on 'the past', but do London and Dublin want it?